I'm Jim, the real guy behind twiDAQ and I need your help. Let me be honest. If you really want to enjoy twiDAQ we need more traders. More traders means more trades, blowing the roof of the trading limits, a more volatile market and faster moving prices. It means becoming a real-time Zeitgeist. So today I'm sharing my personal goal with you. Because I need your help. Can you find just two minutes to help me? To celebrate the launch of new twiDAQ we asked the hugely talented David Blatch (currently up 1.60%) to create a timeline infographic to show the history of twiDAQ. Over the last couple of years we’ve gone from a proof of concept to a bustling online game with an awesome community of traders! A while ago I wrote about the future of twiDAQ on my personal blog and explained why I though twiDAQ was broken. Since then we've been working tirelessly to make twiDAQ the awesome game we truly believe it can be. Get involved - Get your invite! Now, finally, if you'd like to take twiDAQ v3 for a spin you can sign up for an invitation. To do so simply sign in with Twitter and you'll be added to the list. Over the next couple of weeks, while we're letting folk in slowly, I'll be telling you about a few of the new features we've added and why we think they're going to make a difference. We'd love to know what you think so don't be shy - hit us up @twiDAQ and tell us what you think. Item #1 - The NOW! I realise many of you don't yet have access so I'm going to start with something you can all see. This year we've introduced a brand new index - The Trending Index. Unlike the other twiDAQ indices which are carefully compiled by hand the Trending Index is constantly rebuilt from Twitter accounts associated with the current trending topics. This allows us to surface the stocks that you're likely to be most interested in trading right now. Could the new virtual stock exchange for Twitter provide real-time sentiment analysis where other social media evaluation tools have come up short? 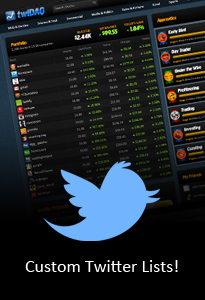 The free-to-play virtual stock exchange twiDAQ offers a unique opportunity for organisations, marketers or brand managers to gain real-time sentiment from Twitter. Launched earlier this year, twiDAQ gives Twitter users the chance to own a portfolio of virtual shares across many indices. As traders buy and sell shares, stock prices fluctuate according to their popularity and influence. A number of tools exist which aim to track sentiment on Twitter but to date the results are often delayed or diluted. For brand & social media managers, tracking the sentiment around their company or brand is becoming essential. The closer to real-time this tracking becomes the better able they are to react to instant fluctuations in their reputations. twiDAQ hopes to close the gap dramatically between public insight and the reaction of brands to that ever changing perception. 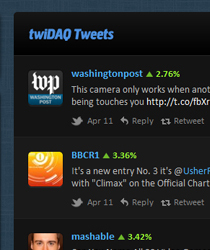 On twiDAQ, share prices are affected by the volume of trading activity among players, as well as the number of mentions and retweets Twitter accounts receive. The profitability of a commodity is defined by its ability to grow its influence. Having this real-time feedback from an online community could prove a useful tool for crisis communication, brand management and consumer outreach. Although we are more than aware sports does not appeal to every user of twiDAQ, which is why many more indices have been added including; The Wall Street Journal, MarketWatch and AllThingsD, these new indices that have been introduced can be found under the ‘Press’ stocks of twiDAQ. As new indices are being added on a regular basis it’s always a good idea to view your twiDAQ account on a regular basis, to see who can help you go up through the levels! Worldwide events such as the Olympics and Barclays Premier League season are starting very soon, so it would be a good idea to go and invest in some stocks now! We know that only being able to trade from 9am to 6pm can be a bit of a pain so this month we're going to give away a few coveted 24hr Trading accounts to the folk who manage to refer the most of their friends to join them playing twiDAQ! It couldn't be easier. Start today! 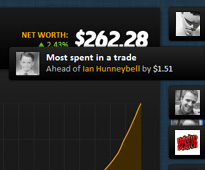 Or use the referral widget on your portfolio page and we'll email them for you! 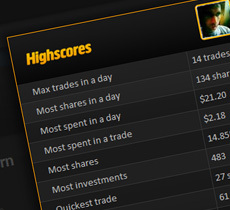 .. but this month only we'll also be giving away 24hr trading to the 10 folk who refer the most people! One of the key tactics in trying to get ahead of your fellow twiDAQ traders is to look at popular events and purchase shares in advance, before dumping them at the end of the occasion. So with that in mind, it is perhaps not surprising that as this week sees the start of the @wimbledon tennis championships, its share price on twiDAQ has risen fairly dramatically. Many tennis stars including @andy_murray, @clijsterskim and @rafaelnadal are on twiDAQ, so try and keep an eye out on their performances in order to cash in on individuals as they continue their journey to lift the trophy at SW19 or crash out of the competition in dramatic fashion! As the tennis world watches Wimbledon, why not keep an eye on the twiDAQ Tennis index over the next two weeks?